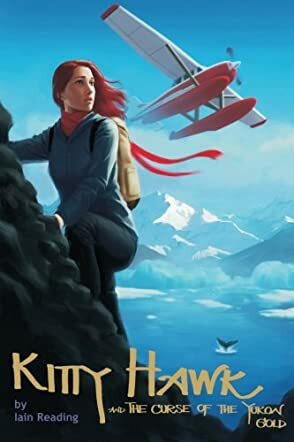 A very promising start to a new series of adventure novels directed towards young adults, Kitty Hawk and the Curse of the Yukon Gold by author Iain Reading was a fun, high-flying adventure from the start. Recent high school grad Kitty Hawk leaves her home in western Canada to spend the summer in Alaska, studying humpback whales. Adventures abound, and when Kitty gets involved in the mystery of the Clara Nevada, a sunken ship, you’ll find yourself on the edge of your seat and along for a wild ride as she uses all of her wits to solve it. Along the way, Kitty learns about the history of the Klondike gold rush, and encounters unsavory criminals, stolen gold and creepy curses, all en route to an exciting conclusion that will have you guessing to the end. A fun new series with a delightful and adventurous heroine, Kitty Hawk and the Curse of the Yukon Gold was a great read full of educational tidbits that will keep the reader learning without feeling like they are reading a textbook. Most highly recommended for tween and young teen readers, this book would appeal to any reader who enjoys mysteries, an adventurous and fast-paced read, or someone who enjoys reading about an interesting and strongly developed young female protagonist. Iain Reading’s writing style is engaging and moves the reader right along. He is also able to teach about historical events without making the reader feel like he’s hitting you over the head with the educational parts. This book is the first in the Kitty Hawk Flying Detective Agency Series and I, for one, am very much looking forward to the next installment!